Boy am I glad I was able to find a vial of White Lab's new Brett Trois strain late in the season, after it had sold out in most shops. The first beer I brewed with it — Cairn, a sessionable white IPA — was maybe my personal favorite beer to date, fully embodying the big tropical fruit character I had read about and hoped for. Wanting to really get a sense of what Trois could do, I designed this second beer as a more neutral 100% Brett beer — something "plain" to compare to my first, hoppy Trois beer, as well as the high ABV Belgian golden strong ale I brewed earlier this year with White Labs Brett L and Wyeast Brett B. Basically, I wanted to isolate the flavors of Brett Trois in a medium-bodied, medium-strength beer. Being that I designed this one to be technically kind of boring, at least on the recipe end, I had no idea what to expect. And that was kind of the point. How big of an aroma would Trois create on its own, with no hop-support? How different would this end up from the similarly-simple Brett B/L beer I did, which, in the traditional of high ABV Belgians, relied simply on the yeast (and oak, and honey) for its complexity? Turns out there's still quite a lot going on here, and quite a bit more to learn about Trois. After giving bottles a few days in the fridge, this pours brilliantly clear (as long as I pour with a steady hand and am careful with the sediment), as clear as any commercial, filtered beer I've seen. My first Trois beer was the same; this yeast just drops hard once carbed, unlike any other yeast I've seen. The beer is darker than I expected, especially given the clarity — a nice amber-hued gold. Big aroma, big flavor, big complexity, all from very little. Trois is one hell of a yeast — quite possibly my favorite yeast at the moment, even if it isn't as versatile as my other favorite, Conan. In some ways, I'm surprised how different this beer turned out from Cairn. It's obviously missing the hoppy bite (and tropical / citrus complexity) of that batch, but boasts a whole new set of flavors. The aroma, particularly, is still overwhelmingly fruity, but this time of a more tangy, acidic sort, while the taste invites some slicker, tart berry flavors that I don't think I've ever gotten in a beer before. I would seriously believe there was actual fruit in this if I didn't know better. The full range of fruit flavors this beer conjures is absolutely staggering: pear, candy grape-flavor, tart berries, currants, and something vaguely, un-specifically tropical. There's a hint of spice in the finish, a trace of alcohol warmth after a while, and some rich slickness that verges on fruity itself, like sucking on fruit flesh in your mouth. To hop this, I used 2 ounces of Smaragd, a new German variety being marketed as an attempt at a fruitier, American-type hop. It's hard to say how much of these flavors might be from the Smaragd, and I'd wager some of the spiciness and perhaps some of the general "fruitiness" is enhance by these hops. But while I can't say for sure, I'd wager that using a basic American hop like Centennial would produce very similar results. The higher ABV definitely boosts the mouthfeel, and while it's still firmly on the "light" side, it's got a slickness and richness that easily dispel any worries that this would turn out watery. In fact, I quite like the mouthfeel here — it's soft and smooth and easy-drinking, although with that slickness I mentioned up hitting you in the finish. There still is something about the mouthfeel that's indicative of 100% Brett beers, and I don't think I would ferment a thick, oily stout or porter with 100% Brett. But for lighter beers, I think boosting the ABV and adding a bit of wheat, oats or rye to the mouthfeel should make body a non-issue. This pours with very little head, and that might be mostly that I didn't carbonate it enough (I had a hard time estimating how much was left in the carboy with this one). 100% Brett beers are tricky when it comes to actual sourness — Brett can produce acetic acid when exposed to enough oxygen, which is fairly likely to happen in the barrel-aged projects commercial breweries go for, but far less likely to happen in a homebrewer's Better Bottle carboy. For various circumstantial reasons, this batch ended up with an unusual amount of headspace in primary and an extra week of aging, As a result, or so I'm assuming, this has a touch more acidity than my previous 100% Brett batches, and it adds nicely to the tart berry character. But given my attempts to make my Brett L+B golden strong ale as funky as possible with two months of aging, I'm starting to think that Trois just naturally produces a lot more tartness than other Brett strains. (A notion that certainly invites more experimentation). Still, it's far from the point where I'd call this a "sour" beer, and I don't expect the acetic acid to grow much now that this in the bottle. It's hard enough to fit 100% Brett beers into conventional styles, even when you're just taking accepted nomenclature and slapping "100% Brett" in front of it. Being that the grain bill here is so generic, it doesn't really fit... anything, so far as I can tell. Farmhouse ale? Belgian pale ale? Brett beer ale? 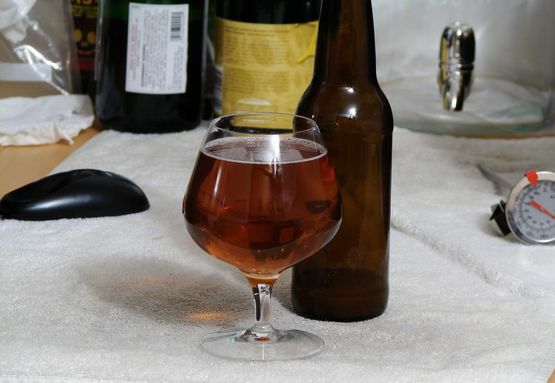 I brewed it mostly as a "comparison beer," a means to evaluate Trois on its own. But I'm really impressed with the result, and surprised how unique this came out — it's one of the most complex beers I've tasted from such a simple arrangement. I could see some drinkers thinking this was too fruity — it's a fruit-bomb without the balancing bitterness of hops to back it up. Trois of course shines in hoppy beers, but I think it'll make for a great blending yeast as well, in 100% Brett beers that rely on a mix of strains for their character. In such a beer, I can see Trois adding the fruitiness and tartness early on, before each strain starts developing more acidity and barnyard funk, leading to an eventual, beautiful blend of wild, funky flavors. What temp and how long do you ferment your all Brett beers? All of my Brett beers were fermented at ambient room temp, ~70 degrees. I haven't noticed any off-flavors or had any attenuation issues at that temp, but I haven't had a chance to experiment with a wider spread yet. From what I've read elsewhere, you can push Trois pretty far in either direction without negative effects. Maybe this summer I'll try a temp experiment. My Trois batches were both done in 3-4 weeks. I haven't seen any reason to treat 100% Brett beers any differently than if I were fermenting with a Sacc strain; they have all hit their FG pretty quickly and stayed there (no over-carbing or anything).